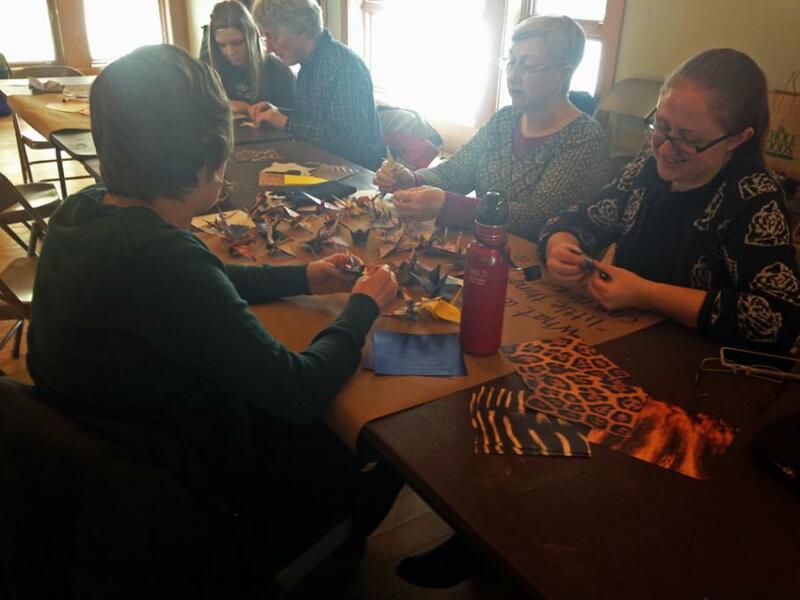 Evanston resident Jessica Iverson (right) and others fold origami at “Flight for Peace.” The event was held at the Evanston Ecology Center and is a part of the Winter HeARTh series. As part of an ongoing winter program series, the city held an event Sunday where attendees attempted to fold 1,000 origami paper cranes to promote a wish for peace. The Evanston Arts Council sponsored “Flight for Peace,” as part of the city’s Winter HeARTh series. Held at the Evanston Ecology Center, 2024 McCormick Blvd., from 10 a.m. to 4 p.m., residents and non-residents could stop by and fold as many cranes as they wanted. The Winter HeARTh series attempts to bring people together through art during the winter months. The series, now in its second year, launched its 2015 programming with “SplatterDance” in February. “Flight for Peace” was the second and final event for this year. The idea for the event came from a Japanese tradition called senbazuru which promises a person the fulfillment of one wish if he or she folds 1,000 paper cranes. “We shifted the tradition a little bit for our purposes to say that as a community we could come together to fold 1,000 cranes so that we as a community can make one wish towards peace,” said Jason Brown, the program assistant for the city’s cultural arts coordinator. There were minimal paper instructions at the event so that attendees would instead have to teach and learn from others there, Brown said. At around 1:30 p.m., there were about 15 people there. Jessica Iverson, an Evanston resident, said she attended the event because she thinks the message of peace is very important as she is a pacifist. Iverson attended last year’s Winter HeARTh series events and said the series tries to draw the community together in the season that least naturally does that. In addition, by having the event sponsored by the Arts Council as opposed to a smaller organization, more people are drawn in and attend, she said. Mary Jaminski, a Skokie resident, works in an office at the Ecology Center and went to the event because it was children-friendly. She said the event was a great way to build community while doing something productive. Iverson also liked the event for its not only children-friendly environment, but its age-friendly environment, she said. The series partners with public spaces to foster the event. The partner for “Flight for Peace,” the Ecology Center, will house the cranes in a temporary installation and they will be hung in the center’s hallways for passersby to see. Brown said in the end the amount of cranes folded does not matter as much as the ultimate message. “I think that the wish that we had to get the community together making a craft has already been granted,” he said.